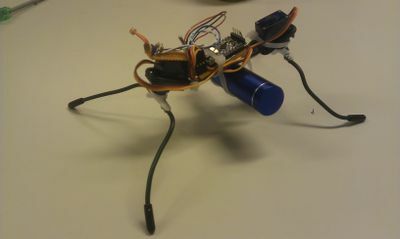 Based on the Andrew Miller walker, it consists of two mini servo's that each control two legs. The Arduino controls the servo's through the servo library. The one-chip logic controller from the Miller design is left out completely. To add a little more fun, a voltage devider consisting of two LDR's is added. The stroke of the rear legs is adjusted depending on the voltage and gives the walker a slight photophilic behaviour. I say slightly as the walker has a turning radius of several meters. Build an assembly out of 50PCS Photoresistor GL5537 LDR Photo Resistors Light-Dependent NEW to give an illusion of bug eyes. Probably, only a couple of LDR's will be used on either side. This page was last modified on 16 May 2014, at 09:04.